“I am very happy to convey the news about teaching in AY2008/2009. DBS did very well and received the largest number of faculty teaching awards for any FOS [Faculty of Science] department (7). We also topped the list for part-time TA awards. Over three Saturdays in September, some 40 organisations hit the beaches and mangroves around Singapore as part of the International Coastal Cleanup Singapore in an effort to count, categorise and collect marine trash. 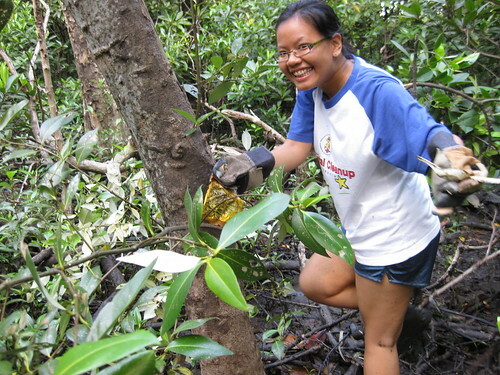 The Singapore programme is in its 18th year and I have been national coordinator since 2000 as a result of seeing so much trash in the mangroves! 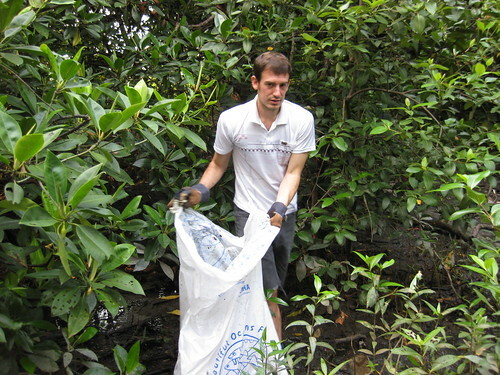 After more than ten years of mangrove cleanups, I finally turned my attention to Sungei Pandan mangrove in 2008. This tiny remnant strip nearby campus has accumulated a heavy load of trash over the years. 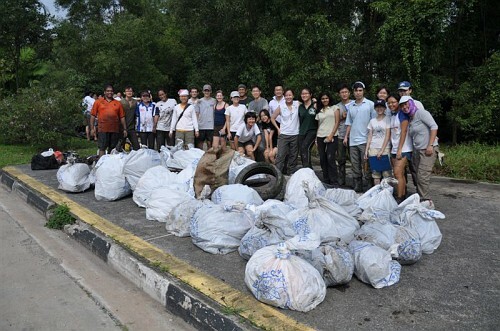 Partnering department alumni, staff and students who anchor this cleanup is Wildlife Reserves Singapore (Singapore Zoo, Night Safari and Jurong Bird Park), our co-founding ICC partners at this site – and they count some of our alumni amongst their staff! Here are some photos from the cleanup featuring some familiar faces – the rest are at the Habitatnews Flickr album and WRS photos are on Fotki. Data results are on the ICCS webpage. Lots more out there so join us at Lim Chua Kang (Jul/Aug) and Pandan (Sep) next year. Just join the mailing list on the ICCS webpage and I’ll alert you next year. 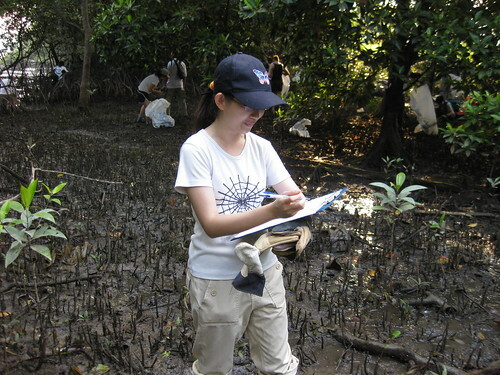 Weiting (hons) taking a break from her thesis in the mangrove core! Anne Devan (hons) in action! Tue 15 Sep 2009: 6:30 pm – 9:30 pm. Thanks to Shirley Lim, NIE/NTU, for the invitation. “Through his dedicated and sustained efforts in Bangladesh, Laos and other countries in Southeast Asia , Dr. Gupta made small scale aquaculture a viable means for over one million very poor farmers and women to improve their family’s nutrition and wellbeing,” – Kenneth Quinn, president of the World Food Prize Foundation, 2005. See the World Food Prize laureate webpage. “Challenges in Sustaining and Increasing Fish Production to Combat Hunger and Poverty in Asia,” by MV Gupta. NAGA, WorldFish Center Quarterly Vol. 29 No. 1 & 2 Jan-Jun 2006 – pdf link. “Modadugu Gupta’s Blue Revolution.” Siliconeer, 6(7), 2005. News link: “Indian fish-farm researcher nets World Food Prize,” by James Njoroge. SciDev.Net, 19 Jul 2005. Gupta’s research focussed on improving rural livelihoods by farming freshwater fish. Nobel Peace Prize laureate Norman Borlaug [Father of the Green Revolution] set up the World Food Prize in 1986. Each year, it honours individuals who have made “vital contributions to improving the quality, quantity, or availability of food throughout the world”. Modadugu V. Gupta, who recently retired from the Malaysia-based WorldFish Centre, spent more than 30 years researching ways of making fish farming a sustainable contributor to rural livelihoods. 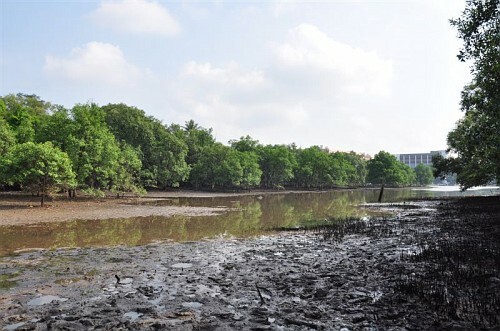 Pandan mangroves is a remnant strip mangrove in the south-west of Singapore. As it is not looked after, there is a trash build up that is deterimental to the site. The Raffles Museum Toddycats and the BioD Crew (NUS) and Wildlife Reserve Singapore are conducting a cleanup for the second year under the International Coastal Cleanup Singapore. 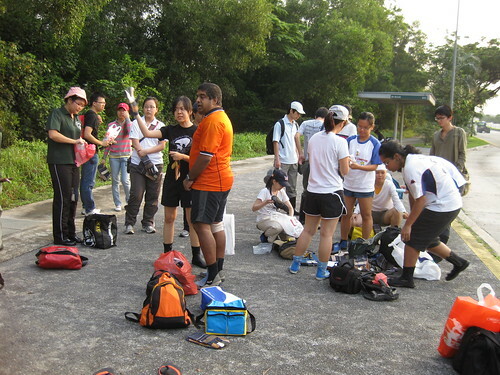 This year we will be joined by some trainees from the Singapore Police Force. 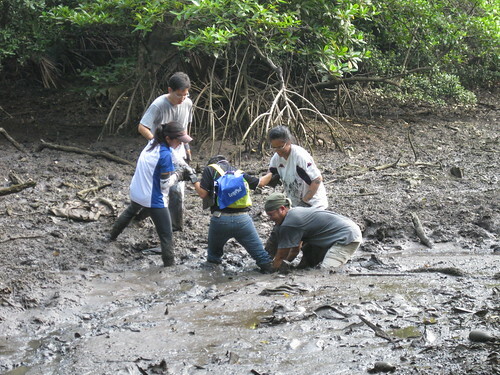 The deeper parts of the inlet is a tough and dirty site to tackle, with no shelters or toilets but soft mud, lots of mosquitoes in tide pools and some snakes instead! We will work rain or shine and are restricting numbers to reduce impact. A light pair of long pants will help protect your legs from insect bites if you tend to get bitten, as well as from the debris. Darren Yeo is back after two years at Notre Dame. Welcome back, dude!